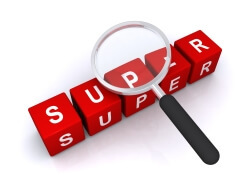 Why Life Insurance from your Super Fund may not be so super! The Productivity Commission estimated in 2018 that around 12 million Australians have life insurance, such as death, TPD and income protection, through their super fund. Most of this is default or automatic insurance. Auto acceptance and being able to pay premiums out of a super balance can make it attractive to have insurance through a super fund. However there are a number of reasons why super fund policies may not be as good as retail policies held outside of super and paid for personally. Many of these issues also apply to SMSF life insurance policies. It is often assumed that insurance from a super fund will be cheaper than a retail policy outside of super because super funds can obtain bulk or “group” rates from insurers. However group rates do not always translate into cheaper rates for all members, with young people and non smokers frequently subsidizing the premiums for older age groups and smokers. Also in recent years rising claims have meant that super funds have experienced large jumps in their premiums. As a result, whether your super fund premiums are cheaper or not will entirely depend on which super fund you are with and what deal they have been able to negotiate with their insurer. As an example, see the graph below comparing premiums from 11 different super funds (Unisuper, Care Super, First State Super, Australian Super, Sunsuper, VicSuper, Local Government Super, Telstra Super Personal, Plum Super, HESTA Super and REST Super) for $1M Death and TPD (Any Occupation) cover for a 45 year old white collar professional non smoker male living in Victoria. 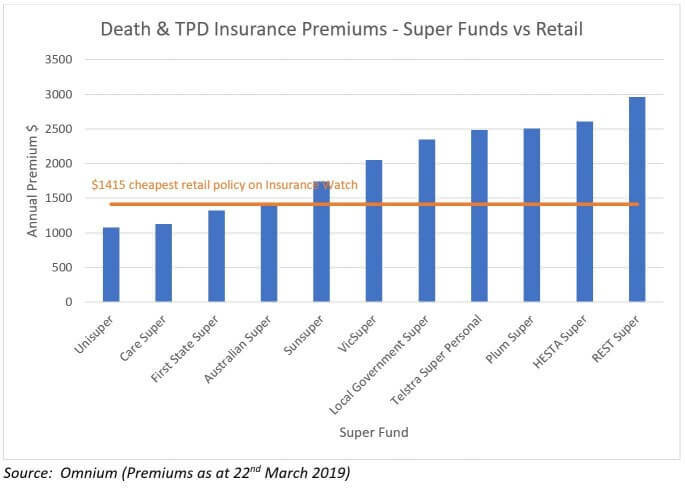 In this case only 3 of the super funds shown have cheaper insurance premiums than the lowest retail premium available from Insurance Watch’s range of insurers. To compare the cost of your super policy to retail policies from 10 different insurers go to Compare Quotes now. The terms and conditions of a retail insurance policy are set out in a Product Disclosure Statement. They are guaranteed renewable (i.e. guaranteed as long as you pay your premiums) and not subject to change once the policy goes into force. An industry or employer super fund’s policy on the other hand is not guaranteed renewable. The terms and conditions of their policy are set by agreement between the super trustee and the insurer, with the contracts being put out to tender every couple of years. When the terms are changed this affects existing policyholders as well as new policy holders – as explained in the video Industry Superfund Insurance vs Retail Insurance. An example of how policyholders can be affected is the significant watering down of the TPD definition offered by AustralianSuper in November 2014 as a result of the renegotiation of their insurance deal with TAL. Normally a TPD claim can be made if a worker suffers an injury or illness which prevents them from ever working in a job they are suited to by their training, experience or education. However the new AustralianSuper definition also required an assessment as to whether or not that member was able to reasonably retrain or reskill. Another example is the deal struck between MTAA Super and MetLife Insurance in March 2015 in which the definition of TPD was changed from being “unlikely ever” to be able to return to work, to requiring that the member prove they are “unable ever” to return to work. This small wording change increases the difficulty of being able to make a successful TPD claim. Many Australians think that the Life and TPD insurance they receive through their super fund is enough. But these amounts on their own are unlikely to be adequate. Rice Warner warned in their Underinsurance in Australia 2017 report that the underinsurance gap is still significant in Australia despite default insurance through super. While 94% of all working Australians have some form of life insurance, the median level of this cover is only around $143,500, or less than twice the median household income of $75,000. Only 81% of working Australians have TPD insurance and the median level of cover is only $99,500, or less than one and half times median household income. 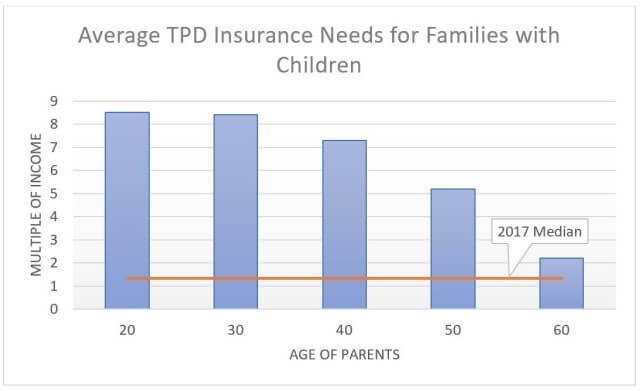 This compares poorly to Rice Warner’s estimated needs for Life insurance and TPD insurance in order to replace income lost. 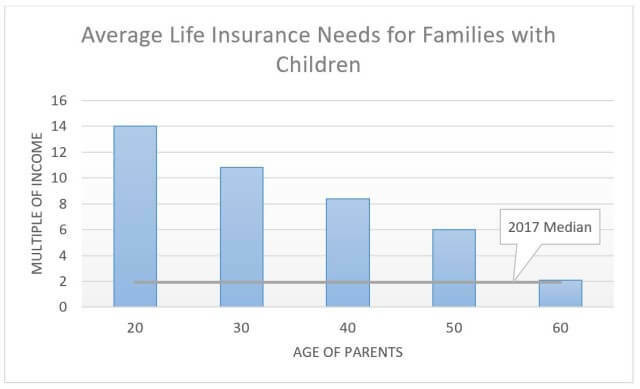 The graphs below show the average needs of families with children expressed as income multiples at different ages. The 2017 median income multiple is shown as a straight line, showing a serious shortfall in most age brackets. While many super funds allow you to apply for increases to your default super cover the amount of this cover may be limited. This compares to retail policies where Life and TPD insurance of up to $5M is generally available. If the default insurance from super funds is provided in a unitised form then the number of units may decrease as you get older. This could mean your cover will be automatically reduced just when your risk of claiming is highest. Retail cover will not be reduced unless you specifically request this. Most policies provide opportunities to increase your cover without medical underwriting, either through CPI indexation or on the occurrence of certain life events, such as getting married, having children or taking out a mortgage. To find out the cost of supplementing your super cover with a retail policy go to Compare Quotes now. Under super you have fewer choices as to the beneficiaries you can nominate to receive your death benefit compared to a retail policy. With a retail policy you can nominate any person, business or company as your beneficiary and the proceeds will be paid to them directly. Super beneficiaries need to be financial dependants or your Estate. Financial dependants include your spouse, children or someone with whom you have an interdependency relationship (e.g. a carer relationship) or who is otherwise financially dependent on you. Leaving a benefit to someone other than a financial dependant under super (e.g. friend, nephew, niece, grandchild, charity etc) can only be done by naming them in your will and nominating your Estate as a beneficiary. This opens up the possibility of the will being contested and a delay in the proceeds being received. This could also result in tax being payable on the proceeds (see below). A claim under a retail insurance policy is paid directly to you, or in the event of your death, to your beneficiaries. However, when the insurance is through a super fund (including a SMSF) the insurer will pay the benefit to the trustees of the super fund. The trustees then have to determine if a condition of release has been met and who should receive the proceeds. Therefore the claim process can take much longer. With a retail policy you can control who will receive the insurance proceeds in the event of your death by nominating beneficiaries. If you choose not to nominate any beneficiaries the benefit will be paid into your estate and distributed according to your will. Under a super policy, if there are no binding beneficiary nominations, the super fund trustees will have discretion about how to distribute the death proceeds. A non-binding nomination will only be treated as an indication of your wishes and the trustees are not bound by this. If you have not made a nomination, or your nomination is invalid (e.g. because your beneficiary is not a financial dependant), you cannot assume that the super trustees will automatically pay your super death benefit to your estate. The trustees will use their discretion to distribute the funds and this could result in the money not going where you intended. It could also expose the benefit to legal challenge or tax (see below). Where a retail Life or TPD policy is owned personally the benefits will generally be 100% tax free. However for insurance within a super fund this is not necessarily the case. For death benefits, it will depend who receives the proceeds of the super policy. If the beneficiary is not a tax dependant, e.g. they are a non-dependant child aged over 18 or any other person not considered to be a financial dependant, they could be subject to 32% tax. For a TPD insurance benefit, part of the lump sum payment received from the super policy will be subject to 22% tax, unless you are aged over 60. The amount subject to tax will depends on how long you have been a member of the fund relative to your total eligible service period. Paying premiums from a super balance may be appealing, but ultimately there is no such thing as free money. The premiums are coming out of your super balance and reducing your retirement savings. This effect is magnified by the compounding returns earned on your super over time. 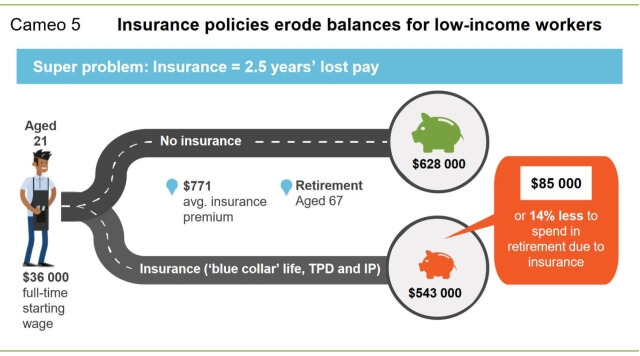 The Productivity Commission estimated that for those on low incomes or with intermittent work the detrimental effect of insurance premiums on their retirement balance could reach 14% or $85,000 and as much as 28% or $125,000 for some disadvantaged members. It is possible to reduce the impact on your retirement savings by increasing your super contributions each year through salary sacrifice or other personal contributions, but these additional amounts will count towards your contributions cap. Super death policies generally have expiry ages of 65 or 70. This is earlier than most retail policies which can be renewed to age 99. While the need for life insurance after retirement may be limited and the premiums are quite high, the cost of this cover is generally a fraction of alternatives like funeral insurance. Retail insurance policies generally offer greater benefits than super policies. This is mainly because superannuation legislation limits what insurance benefits can be offered under super. Retail life insurance policies, in addition to paying on death or terminal illness, may offer an advancement of funds to cover funeral costs, reimbursement of financial planning costs, grief counselling sessions, child trauma cover or payment of accommodation costs for you or your family living away from home while you are terminally ill.
Retail TPD policies may include a partial disablement benefit which is payable on the loss of a limb or sight in an eye, regardless of whether you can continue to work. This benefit is not available under a super policy. Retail policies can also provide TPD cover for homemakers and others who are not currently working. Income Protection policies under super are restricted to offering just a total or partial disability. Retail income protection policies, particularly comprehensive policies, offer a range of other benefits. These extra benefits can include accelerated or set payments for specified injuries or traumas, payments within the waiting period if you are hospitalised, payments if a family member has to stop work to care for you, payments for home care services and child care and reimbursement of rehabilitation or retraining costs. Although super fund default cover may be automatically accepted without health questions or medical exams, in some cases a general exclusion will be applied for pre-existing health conditions for a period of time, which can be for first 5 years of the policy. The problem with this is that you may not realise that you aren’t covered for certain conditions. This compares to retail policies which are fully underwritten upfront. You disclose your medical history and the insurer advises if they will exclude any specific conditions, so there is no uncertainty about what is covered. Most super funds only offer stepped premiums i.e. premiums which “step up” or increase with age. However retail policies also offer the option of level premiums which do not increase with age up until either 65 or 70. For those who expect to hold their policies over a long term horizon i.e. more than 10 or 15 years, level premiums offer the potential for significant premium savings. One of the problems with stepped premiums is that increasing premiums in the 50s and 60s age groups can result in policies being discontinued just when the risk of claiming is at its greatest. Level premiums help keep policies affordable and able to be maintained. Many industry super funds have rules under which your insurance cover will cease if you stop contributing for a period of time or if your super balance falls below a particular level. The risk is that you may not be aware of these restrictions and that you are no longer covered. This compares to retail policies where usually cover will continue as long as you pay your premiums. In 2018 Federal Budget the government announced measures to make insurance opt-in for those aged under 25 and some funds have already implemented this. This means that younger members may no longer receive automatic insurance cover from their super fund. If you decide to switch superannuation funds you may find that your insurance policy is not portable i.e. your cover will lapse if you are no longer a member of the fund. While some funds will allow you to transfer your policy to personal ownership this may require undergoing health checks and the insurer could charge more to continue the cover. Retail policies on the other hand are not affected by changes in your employer or super fund. If you decide that you would like to pay for your policy from your super balance you can usually change to a retail super policy without any medical underwriting. Super funds are restricted by legislation to offering TPD (Any Occupation) cover. Under this definition you generally have to be unlikely due to illness or injury to ever work in any occupation you are suited to by training, experience or education. TPD (Own Occupation) cover is only available outside of super. This definition provides superior cover to highly paid, skilled or specialised occupations. It is easier to claim under this definition because your incapacity is measured against your current occupation, rather than any other less skilled occupation you may be able to perform, which may have a significantly lower income. The main benefits under an income protection policy are the total disability and partial disability benefits, therefore how these are defined is important. Super definitions of total disability are generally based on not being able to perform the important duties of your occupation. There are a number of retail policies which offer a three-tiered definition of total disability. This allows you to choose whether you claim on the basis of a duties, hours or income definition. The hours definition generally allows you to claim if your hours worked has dropped below 10 hours a week and the income definition if your income has dropped below 20% of your pre-disability income. This flexibility increases the chances of making a successful claim. Super fund policies can cease to offer you income protection cover if you are unemployed, taking unpaid leave or not making super contributions. Retail policies will generally continue to cover you while you are not working. This means that if you suffer an illness or injury which would prevent you from looking for work, you will still be able to claim. Premiums paid for a retail income protection policy can generally be claimed as a personal tax deduction. However you cannot claim a personal deduction for a policy provided by your super fund. This is because your super fund is the owner of the policy, not you. Your super fund will claim the tax deduction for the premiums paid and pass this on to you via your investment returns. As a result there is no tax advantage in having your income protection policy through a super fund compared to owning a retail policy personally. Rice Warner’s 2017 Underinsurance report estimated that only a third of the working population currently have income protection insurance. If your super fund offers income protection it is most likely with a benefit period of 2 years only. This compares to retail policies which also offer benefit periods of 5 years or to age 65 for most occupations. A 2 year benefit period does not provide long term security. If your injury or illness extends past 2 years your income protection payments would stop and you would then be reliant on social security. For a 30 year old, the difference between a benefit period paying to age 65 and a 2 year benefit period could be up to 33 more years of payments. In some cases super funds will cease paying income protection or temporary incapacity payments once a TPD or permanent incapacity payout is made. However this is not the case with retail policies where lump sum TPD policies and Income Protection policies are treated separately. Therefore a decision to pay a TPD benefit does not affect the ongoing payments under an income protection policy. Typically superannuation income protection policies are “indemnity” type, which means the most that can be paid in the event of a claim will be 75% of your income in the 12 months prior to becoming sick or injured. This may be a problem if your income has fallen in the period just prior to your claim. You may have a lower income because you worked fewer hours or you had an unpaid break from work for maternity or study leave. Or if you are self-employed you may have had a particularly tough year. Retail income protection policies can offer more generous indemnity definitions. Some will pay 75% of your highest 12 month income in the last 2 or 3 years, to avoid your income being unfairly impacted by the most recent year. Agreed Value policies are also available for retail policies. These policies allow you to supply evidence of your income at the time you take out your policy so that the monthly benefit payable is agreed in the event of a claim. This not only gives certainty about what you will receive but also make claiming easier as it will avoid having to dig out income evidence while sick or injured. If you are cashflow strapped and can’t pay for your insurance personally this doesn’t mean you have to accept the policy offered by your super fund. You can purchase a retail Life/TPD or Income Protection policy structured through super and pay for this using an annual payment from your super balance. Usually you will receive a 15% rollover discount for paying in this way. Under superlinking for a small personal payment you can access better benefits or definitions, such as Own Occupation TPD or Agreed Value income protection cover. Trauma cover is not able to be offered by super funds but a retail policy can be superlinked to a super Life/TPD policy in to reduce the cost of the trauma cover. To ask one of our advisers about superlinking go to Get Advice. The above information has been prepared by qualified Insurance Watch advisers. Please note that this is general advice only and may not be applicable to your particular super fund or circumstances. To obtain personal advice which takes into account your objectives, needs and financial situation please go to Get Advice.